From the ptxC4 version 5.0.0 the ptxC4 supports the creation of so-called sequence projects. Unlike the previous cue release using ignition time / ignition number in a consecutive ignition list, the effects in sequence projects are divided into sequences. In show mode the individual sequences can be accessed and triggered via touch fields spontaneously and in any order and combination. This allows a very flexible show execution as it's often desired for live shows. A total of 128 sequences are available, divided into 4 groups with different color assignment. In a fifth group there are 24 sequences for direct activation of DMX scenes. 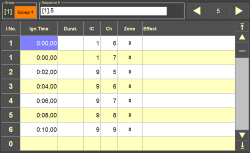 For each sequence, the user can specify a label to be displayed on the corresponding sequence button. 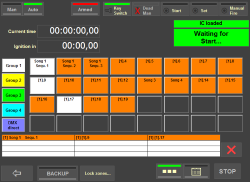 This allows fast access to the desired sequence during the show process. Within a sequence, pyro effects and DMX scenes can be mixed. Sequences that contain at least one DMX scene are displayed again as "restartable" after a trigger during the show execution. The last sequence group is reserved for DMX effects or scenes which can be directly switched on and off by the operator, independently of the automatic execution of sequences of the other groups.